What will it take to end white supremacy? How does white supremacy live inside you and how can you identify and disrupt it? Join renowned feminist theologian, Dr. Rev. Rebecca Ann Parker, and folk healing artist, Richael Faithful, for an intimate and honest conversation about how white folks can deepen their commitment to racial justice. In this dynamic, participatory dialogue, we will explore the way in which theatre and ritual offer avenues for spiritual and aesthetic growth and community renewal. We will embody this exploration through the creation of a walking meditation/ritual that will close our evening by honoring our various backgrounds and spiritual practices. Artisia Green is the Sharpe Associate Professor of Civic Renewal and Entrepreneurship of Theatre and Africana Studies and Director of the Africana Studies Program at William & Mary. As a director, dramaturg, and an initiated indigenous priest within the West African system known as Ifa , she sees theatre as a powerful tool for enabling participants and witnesses with tools to respond to the forces that constantly challenge their humanity. Artisia is published in August Wilson’s Pittsburgh Cycle: Critical Perspectives on the Plays edited by Sandra Shannon and Continuum: the Journal of African/Diaspora Drama, Theatre and Performance. Joanne Braxton is a poet, author, teacher and an ordained minister in the United Church of Christ. President of the Braxton Institute, she is author of Black Female Sexualities (2015) and Monuments of the Black Atlantic: Slavery and Memory (2003) among other books. Also known as Sage, the name given her by Keewaydinoquay Peschel, Joanne teaches contemplative practice and provides pastoral care and spiritual direction at All Souls Church, Unitarian, Washington, D.C. The Braxton Institute Dialogues on Resisting and Thriving engage justice-activists with the nitty-gritty issues that can undermine our success, such as conflicts within our movements, burnout, internalized oppression and benevolent paternalism. The Dialogues prioritize the wisdom and leadership of women of color, and resource our effectiveness through break-through conversations, and by exploring and re-imaging the spiritual resources that have fueled and sustained powerful social change movements—including folk healing, meditation, rituals for empowerment, celebration, and more. This series is generously supported as an Eileen Fisher Community Partner. In this dynamic, participatory conversation, we’ll deeply explore the ways in which creatives are expressing their politics and creating collective healing through the vehicles of art, media, and ritual. We’ll examine the rich history of art activism, resistance, and survival, in communities of color, and how these legacies are shaped in the heightened time of 2018. This conversation, the fourth in a series of Braxton Institute Dialogues on Resisting and Thriving, will be led by three artists: Nicole Oxendine (RiverShe Collective Arts), J. Valoris (the xigga.Projeck) and Richael Faithful (folk healing artist). This event is free and open to the public and no registration is required. Join us for a powerful evening of spirit-connected movement-building! The Braxton Institute Dialogues on Resisting and Thriving engage justice-activists with the nitty-gritty issues that can undermine our success, such as conflicts within our movements, burnout, internalized oppression and benevolent paternalism. The Dialogues prioritize the wisdom and leadership of people of color, resource our effectiveness through break-through conversations, and by exploring and re-imaging the spiritual resources that have fueled and sustained powerful social change movements—including folk healing, meditation, rituals for empowerment, celebration, and more. This series is generously supported as an Eileen Fisher Community Partner. Jessica believes in the power of art to activate imagination, build community, and spark inspired action. Feminist/Womanist/Queer/Indigenous/Black wisdoms; Lineage & identity; Creative Spirit/Source/Soul; and Environmental connection & restoration. Nicole's creative practice is expressed through painting, textiles, assemblage/sculpture, ceremony, & collaborative practice… gratefully guided by my Lumbee, Celtic & Cuban ancestors. A Community Dialogue in Pursuit of Spiritual Thriving and Sustainable Justice. Grounded in the pursuit of spiritual thriving and sustainable justice, this dynamic, participatory community dialogue brings together diverse voices with wide-ranging expertise to engage deeply with the realities of incarceration, racism, and the work of collective justice-making. This conversation, the third in a series of Braxton Institute Dialogues on Resisting and Thriving, will be led by three leaders who embody both theory and practice in their work for justice: Pastor Tina Booker (Radikal4kidz Inc., NYC Department of Correction), Dr. Nigel Hatton (UC- Merced, Braxton Institute), and Chaplain Justin von Bujdoss (Buddhist teacher, NYC Department of Correction). Please join us for a powerful evening of spirit-connected movement-building! This event is free and open to the public and no registration is required. Pastor Booker is native of Brooklyn, NY. She has been married for the past 15 years and is the mother of one daughter. Educated through the NYC public School system and continued on to S.U.N.Y Old Westbury for two years as a Media and Communication Arts major. She completed Ministerial Training 2012 at HRCBC Ministerial Institute after answering her call to ministry in 2009. Pastor Booker began working in the health profession as an administrative assistant and medical biller in 1992 until moving on to the New York City Department of Correction in 1999 as a Correction Officer. Pastor Booker was installed as Pastor of the Full of Faith Christian Center located in Laurelton Queens, launched in October 2016 after being ordained at Historic Rugged Cross Baptist Church as a reverend in 2012. Her vision for ministry is to encourage, inspire and infuse God's love to his people through engaging with the community offering powerful worship services that offer biblical truth in relevant and practical ways. In 2013 Pastor Booker founded Radikal4kidz Inc., a non-profit community outreach creative and performing arts program created as a safe haven for youth and young adults to express themselves through performing and creative arts. The program was inspired by her own childhood struggles as she was labeled a “troubled teen”. Radikal4kidz is a resource for social development and creative freedom. Pastor Booker has dedicated her life to effective community outreach. Through her personal and professional experiences, she understands that a lack of resources can contribute to the mass incarceration epidemic that affect many families in inner-city communities. She is dedicated to creating innovative ways to raise awareness and provide needed resources through ministry and the Radikal4kidz “JAIL IS NOT AN OPTION” initiative. This initiative bridges the gap between law enforcement, clergy, elected officials and the community. Hosting information sessions, community fun day events, and conferences as preventive and proactive measures, we continue to address the mass incarceration crisis in the inner-city communities of New York City and throughout the United States of America. Pastor Booker as received numerous awards, citations and acknowledgements for her community service and achievements within the Department of Corrections. Her life is dedicated to living by example and encouraging all Gods children to live life in fullness. Dr. Hatton is a member of the board of directors of the Braxton Institute and an assistant professor of literature at the University of California, Merced. He is interested in how narrative theory and practice can help lower homicide and incarceration rates in impoverished communities. He has completed introductory and advanced narrative workshops with the Program in Narrative Medicine at Columbia University Medical Center. Dr. Hatton’s work on the uses of story to end black-on-black homicide has gained influence in both the U.S. and abroad. Dr. Hatton’s “African-American Women, Homicide, and Human Rights: How Black- on-Black Murder in Oakland, California, Silently Affects the International Human Rights Movement” is based on a series of interviews over two years with women whose children were murdered. It was turned into a collaborative project with the photographer Susan Latham and named a semifinalist for the Dorothea Lange-Paul Taylor documentary prize. Dr. Hatton began teaching literature and writing courses at San Quentin State Prison in 2003 through the Prison University Project and now volunteer teaches writing courses with the Prison Education Project at Central California Women’s Facility, the world’s largest women’s prison, located in Chowchilla, California. In his academic work, he is the author of several articles on the intersections of global human rights discourses and world literature, as well as the philosophy of Søren Kierkegaard. He received the dual Ph.D. in Modern Thought & Literature and the Humanities with a political science (political theory track) minor from Stanford University. He also holds an MFA from the Jesuit University of San Francisco. Chaplain Bujdoss is an American Buddhist teacher and chaplain. He was ordained as a Repa in the Karma Kamstang tradition of Tibetan Buddhism by His Eminence Goshir Gyaltsab Rinpoche in 2011 and given the name Repa Dorje Odzer and has over 20 years of experience with Buddhist practice. Justin is passionate about the preservation of the heart-essence of the tantric Buddhist tradition in a way that meets the needs of, and simultaneously challenges, the modern western way of life. He is committed to the development of a repa tradition rooted in the west and has been working to this end for a number of years. From 2012 until 2017 Justin served as the resident-lama and executive director of New York Tsurphu Goshir Dharma Center, an urban dharma organization which functioned as an affiliate of Palchen Chosling Monastic Institute, Ralang, Sikkim, India. Justin is presently the first dedicated Staff Chaplain for the New York City Department of Correction where he provides spiritual support for the 13,000 employees, both uniformed and non-uniformed, who work throughout the New York City Corrections system. Part of his work includes developing and implementing meditation programs for officers throughout the NYC jail system in addition to the typical work of ministering DOC staff. Justin has also worked as a full-time home hospice chaplain and is trained both in CPE (Clinical Pastoral Education) as well as Buddhist end-of-life practices and spiritual care. Justin has taught on Buddhist end-of-life care and teaches dharma in a variety of settings from monasteries, retreat centers and dharma centers, to hospital didactics, CPE groups and at conferences, universities and museums. More of his work can be seen at justinvonbujdoss.com. The Braxton Institute Dialogues on Resisting and Thriving engage justice-activists with the nitty-gritty issues that can undermine our success, such as conflicts within our movements, burnout, internalized oppression and benevolent paternalism. The Dialogues prioritize the wisdom and leadership of people of color, resource our effectiveness through break-through conversations, and by exploring and re-imaging the spiritual resources that have fueled and sustained powerful social change movements—including folk healing, meditation, rituals for empowerment, celebration, and more. In this dynamic, participatory conversation, we’ll deeply explore the inspiration and forces that source our stewardship of land, ecology, food, and communities. We’ll examine how imperialist strategies that were devised to disconnect us from, and harm us through land weren’t successful, and the bodies of existing work that are helping us reconnect, repair, and reclaim our ecological-human relationships. This conversation, the second in a series of Braxton Institute Dialogues on Resisting and Thriving, will be led by three Black justice workers: Tracy McCurty (Black Belt Justice Center), Amirio Freeman (Being Green While Black) and Richael Faithful (Folk Healer/Braxton Institute). An anchor to the event’s conversation is the new anthology, Land Justice: Re-imagining Land, Food, and the Commons, to which Tracy and Richael are contributors. This event is open to the public. No registration is required. Join us for a powerful evening of spirit-connected movement-building! The Braxton Institute Dialogues on Resisting and Thriving engage justice-activists with the nitty-gritty issues that can undermine our success, such as conflicts within our movements, burnout, internalized oppression and benevolent paternalism. The Dialogues prioritize the wisdom and leadership of women of color, and resource our effectiveness through break-through conversations, and by exploring and re-imaging the spiritual resources that have fueled and sustained powerful social change movements—including folk healing, meditation, rituals for empowerment, celebration, and more. This advanced training seminar marks a groundbreaking moment in the growing discourse about moral injury among veterans of war and citizens returning from incarceration. One hundred experienced clinicians, caregivers, clergy, and thought-leaders will convene with expert faculty for three days of experiential learning which will inform the ways individuals and communities respond to the invisible wounds of moral injury. 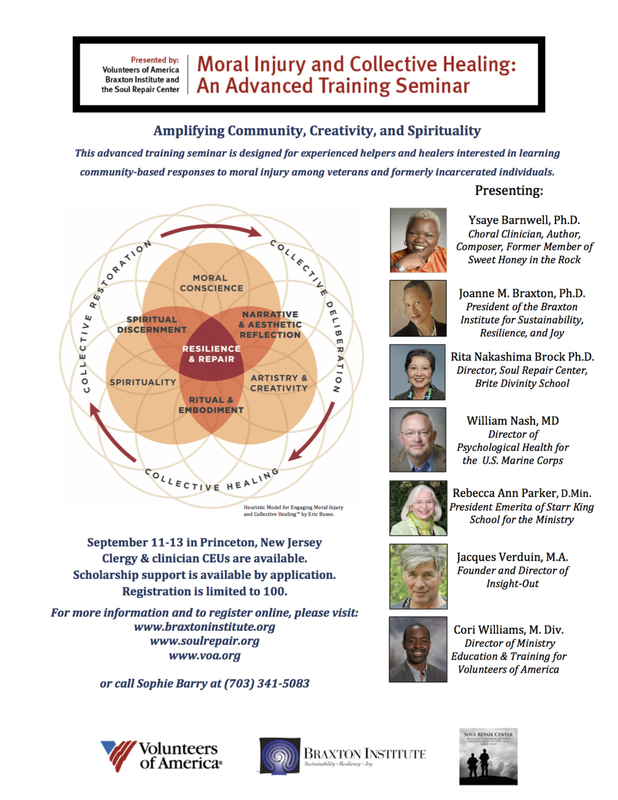 Training will emphasize the dynamics of spiritual practice, artistry, and ritual in community healing. Please click here for more information about the faculty, schedule, lodging, and to submit your registration! Continuing education units will be available. Partial scholarships available by application. This landmark training is made possible through the collaborative efforts of the Braxton Institute, the Soul Repair Center and Volunteers of America. Those interested in co-sponsoring "Moral Injury and Collective Healing: An Advanced Training Seminar" are encouraged to contact info@braxtoninstitute.org for more information.